This gal… oh, this gal. In case you don’t know Stephie of Eat Your Heart Out, get thee over to her blog, stat. She is one of the funniest, most talented and sweetest (she sent me a birthday card — with a kitten wearing a party hat. I MEAN…) bloggers I know. Not only do we have the same name, we also share a confusion over how many shallots is one shallot, a borderline creepsville obsession with Adam Levine and a serious love of our cats. Basically, she’s my soul twin. Oh, and she made you all cookies for a guest post while I’m gone, so… yeah. Cue your applause now. Hello, Girl Versus Dough readers! I am so thrilled to be posting for Steph today. I love everything about her site and her recipes, but even more than that, I adore her! Sometimes I think that we were twins separated at birth –- we are both reality TV-loving, carb and cheese-addicted, Adam Levine-obsessed cat ladies who believe that pants are totally optional at home. Not to mention that we share a name. Basically, we are the coolest people ever. I was raised in a home where, when someone was sick or recovering from surgery or going through a death in the family, food was the answer. It was not unusual for my momma, upon hearing that a friend was going through a hard time, to immediately head to the kitchen and pull together a big pan of mostaccioli, some salad, and a dessert to take over to the family. Now, as an adult, I find myself inclined to do the same. When my favorite college professor recently had surgery, I wanted nothing more than to make a meal to take to him and his family. Unfortunately, he lives three hours away, so instead I settled on mailing him some cookies, just to let him know I was thinking of him. 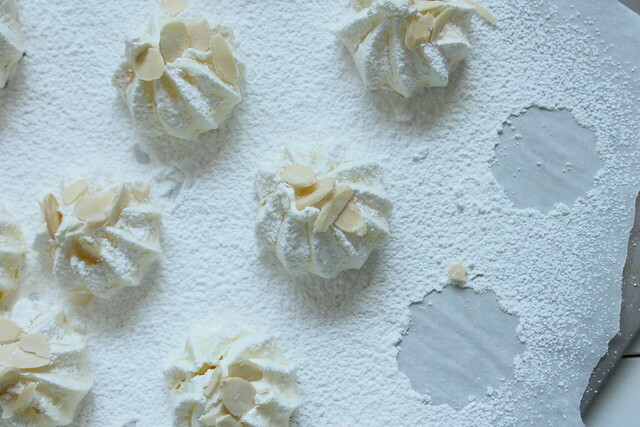 These little meringue cookies are perfect for making for loved ones. They’re light as air, with the perfect amount of orange flavor brightening them up. They also store well, making them perfect for mailing, and they are just as pretty as can be. Oh, and did I mention that they’re gluten free? Preheat oven to 200 degrees. Line two baking sheets with parchment paper. Set aside. Place almond meal on one of the lined baking sheets and toast in the oven for 10 minutes. Remove from oven, toss with the cornstarch and place in a bowl to cool. In the (very clean) bowl of an electric mixer fitted with a whisk attachment, beat egg whites and salt on medium speed until frothy. Increase mixer speed to medium high and gradually add sugar and orange juice. Continue beating until the mixture is glossy white and holds stiff peaks. This will take several minutes, so have patience. It will get there. Once the whites are whipped, add the ground almonds and orange zest and gradually fold by hand with a large spatula. To fold, cut the spatula down the middle of the bowl to the bottom, then bring the spatula up the side of the bowl and over. Turn the bowl 90 degrees and repeat until the mixture is thoroughly incorporated. Spoon the meringue mixture into a pastry bag fitted with a star tip (alternately, you can use zip top bag with the corner snipped off or use a spoon to dollop the mixture onto the baking sheet). Pipe the mixture onto the baking sheet in about 1 ½ to 2-inch circles. Meringues will not spread, so you can pipe them fairly close together. 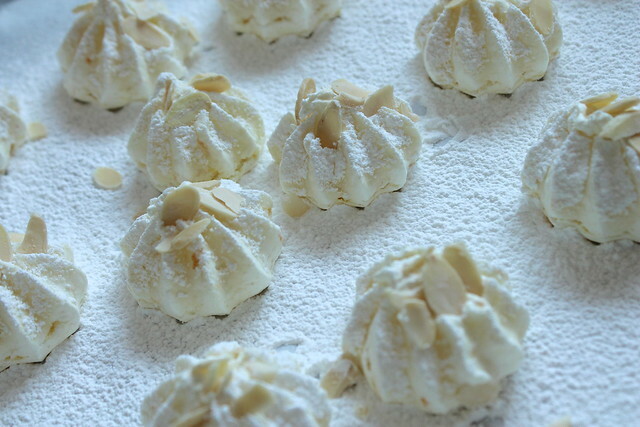 Generously sift powdered sugar over the tops of the meringues, and place a few slivered almonds on the top of each cookie. Bake meringues for 50 minutes. After 50 minutes, turn off the oven and open the door just a crack, leaving the meringues in the oven until the oven is completely cooled and meringues are dry. Once dry, remove from the baking sheet and enjoy. Beautiful! I bet that the two of you have the coolest mothers ever, too! These are gorgeous!!! Wow! Way to go on these! Beautiful! 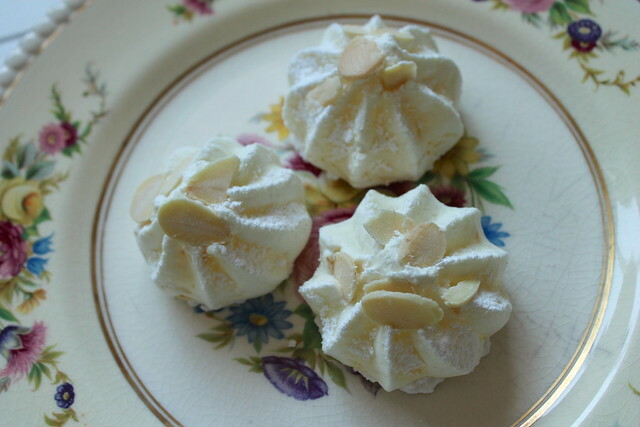 I love meringues–these flavors look wonderful together! So pretty! Like little clouds of heaven! You’re too kind, sweet lady. <3 ya, hope you're having the best vacay ever! Pretty meringues, I love the flavor combo! These are gorgeous, and I love the flavor! Great post! what a great summer cookie…so pretty! Yuuuummm! Those meringues are gorgeous!